﻿ "For Leona" - A portrait of Chet Atkins. The 2001 CAAS Convention in Nashville has just ended and I'll be the first to admit I had no idea what to expect. On one hand, I was sure the event would be a sorrowful, maudlin affair without the excitement of previous years. I had no idea how the performers would play or what they would say on stage given the fact that Chet had died just 11 days prior to the convention. I was pleasantly surprised to see performers moving on with the music just as I imagine Chet would have wanted. Every performer I saw played Chet's music with emotion, love and respect. There was a spirit of Chet's influence which at least for me, kept the convention upbeat. I also enjoyed seeing Paul Yandell play with Ray Cummins. I had not ever heard these two players play together and it was a real treat. I played with Buster B. Jones, Daniele Bazzani from Italy and many many others. I missed not having the chance to play with Julian Smith or Lee Ramirez. So much to do, so little time! There were lots of stories told about funny or inspiring times with Chet. I spent most of my time with some of Chet's closest friends, and I heard incredible, wonderful things about Chet that I did not know. I soaked them all in and felt so grateful to know things 99% of Chet's fans will never know. I felt very close to the man I had met on only 4 occasions. 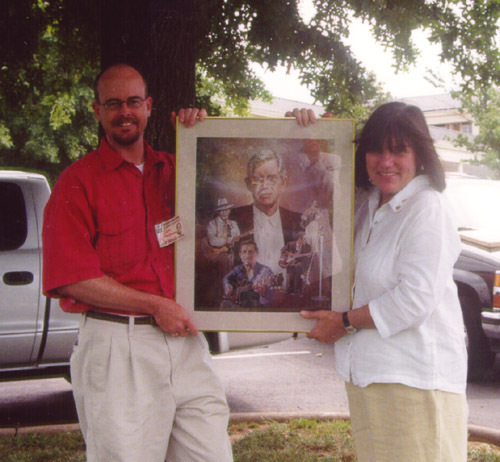 Three months prior to the convention I had decided to give a present to Chet's wife, Leona. "For Leona", would show images of Chet from his early days up until the 90's. I picked Dennis Auth because he had done a wonderful portrait of my father Russ Redmond, who died unexpectantly at age 53 in 1987. Dennis had also done a portrait of Hank Williams Sr. for use on a TNN special. 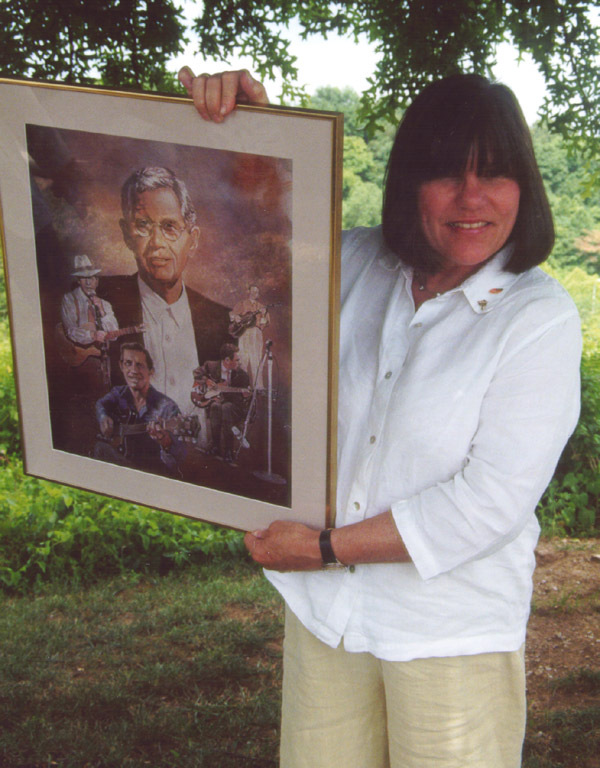 The portrait was completed on June 1, just 29 days before Chet's death. I had hoped to present it to Leona but that also Chet would get to see it. That was not to be. Some folks chose to drive up Route 100 to Harpeth Hills cemetary to see Chet's gravesite, something I didn't feel up to doing myself. 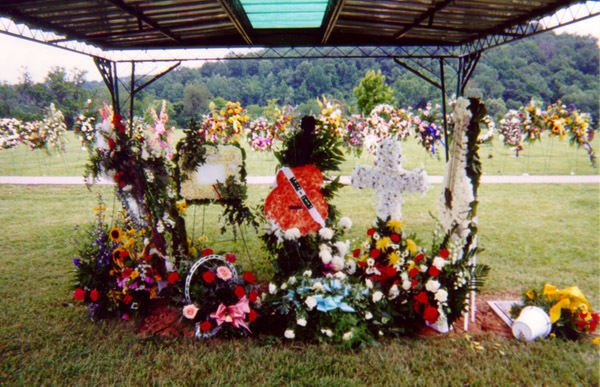 Here are a few photos of some of the flower arrangements around Chet's grave. 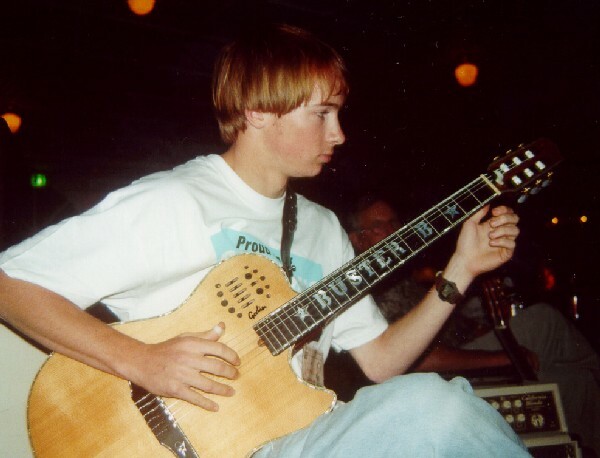 again, playing guitar and listening to others. Conway Twitty's son Mike showed up and three or four of us pickers even SANG a bit, standing around the Grand piano in the lobby of the Sheraton. Russ Jenkins of the UK and I managed to find some cheap cigars. He calls them "rubbish" yet we smoke them Saturday night every year!. One special moment was the highlight of my trip this year. Ted Walters, who has been a Chet fan for fifty years and was a close friend of Chet's for many years was pretty ill this year. He wasn't sure until a few days before the convention that he would be able to attend. 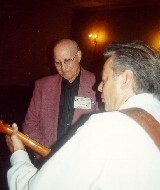 Tommy Emmanuel told me at about 8PM that he wanted to dedicate a song to Ted Saturday night. The player's schedule however, appeared to have Tommy taking the stage late in the evening, perhaps too late for Ted. I told Tommy that Ted might not be around that late at night, and he immediately asked me to get Ted and he would spend a few private moments with him. Ted, his son Chet Walters, and I met with Tommy in a small meeting room for about 20 minutes at around 9 o'clock. Tommy treated Ted to a few special songs face to face. A private concert from one great picker to one of Chet's closest friends. Ted is a friendly, humble man many of us know and love. Before going on stage, Thom Bresh humored me by letting me play "Hangin with the Girls I Know" with him, and someone caught it on video. Whoever it was, please send me the tape! About 4 different people told me I had improved my playing from the previous year. I don't see how, I never get a chance to play. I suspect we all improve in an environment so plentiful with talent. The July convention makes us all play a little better by weeks end.